Have you ever had one of those moments when you are so enthralled by something that you quit noticing time's passage? I had one at the recent production of The Man Who Laughs, Stolen Chair's "silent film" version of Victor Hugo's novel "L'Homme qui rit." From the moment I walked into the theatre to the sounds of the cool American songbook classics provided by Margi & The Dapper Dots, time seemed to pause. The opening act, as good as it was, only hinted at what was to come. The Man Who Laughs was a visual treat from start to finish, and Kiran Rikhye's adaptation was a wonderful surprise. 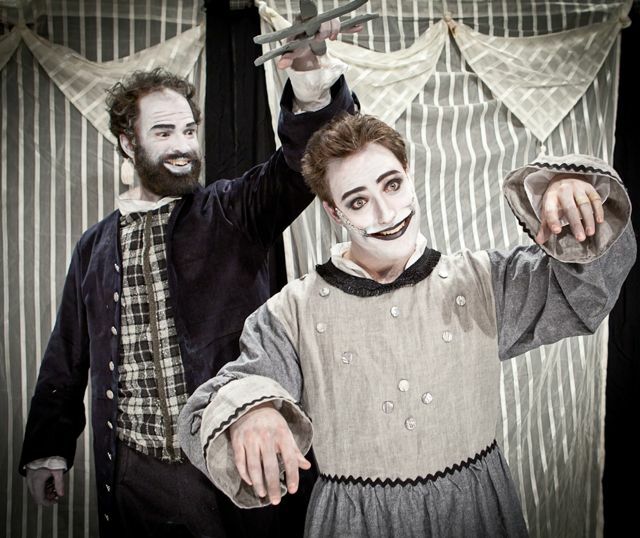 Gwynplaine (Noah Schultz as the young version and Dave Droxler as the adult version) was disfigured by criminals who wanted to force him into a sideshow act; his face is in a permanent grin. Later abandoned by his abductors, he saves the life of a young blind girl, Dea (Molly O'Neill) and is taken in by a crotchety ventriloquist, Ursus (Jon Froehlich). Dea and Gwynplaine join Ursus's ventriloquist act, a generally satisfying life. But Gwynplaine wants more. He rebels against constantly playing a grinning clown in Ursus's show. He knows he can be taken seriously as a dramatic actor, if the audience just gets a chance to see him perform. Naturally, things do not turn out as Gwynplaine hopes, and his foray into dramatic acting takes a tragic turn when he encounters the bored and decadent Duchess Josiana (played with Theda Bara sexiness by Rebecca Whitehurst) and her paramour Lord David Dirry-Moir (Raife Baker). Repulsed and attracted by Gwynplaine's disfigurement, she attempts to seduce him. It ends badly for everyone. The story is melodramatic, but enjoyable. The true strength of this production is the outstanding way that the director, designers and actors recreated the feeling of a silent film. Julie Schworm's costumes and Jaclyn Schaefer's makeup recreated the sepia tones of old movies (extra praise for Schaefer's kewpie doll lips for Dea, a perfect touch). Lighting effects by Daniel Winters and Michael Minahan's sets (especially his use of a scrim) helped create the grainy feel of old film. Winters in particular used some marvelous lighting effects to create a stage equivalent of a tight closeup. Eugene Ma's live music was the icing on the cake. Stephanie Cox-Williams, one of the most creative visual effects designers working in the Off-Off Broadway community, created some excellent special effect makeup for the show. The superb ensemble of actors adapted well to non-verbal performance. Their use of exaggeration, large gestures, mime, broad physical comedy, and other techniques seemingly lost in modern film was excellent. Jon Stancato's direction was strong, and his knowledge of the techniques of silent films showed through. If there can be said to be anything that could use some tweaking, it would be that some of the set changes were overly long. A very minor complaint. 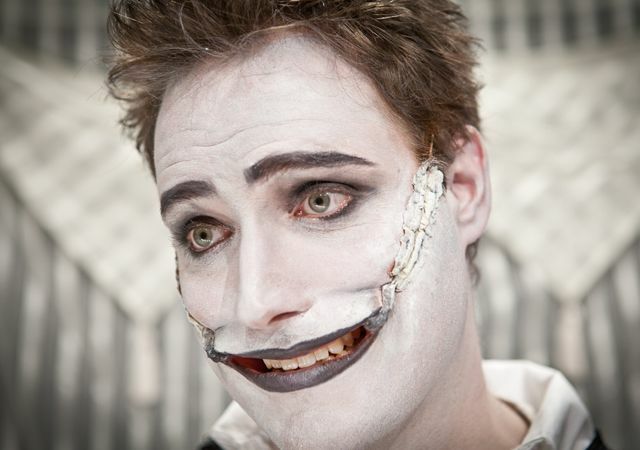 I, for one, would love to see The Man Who Laughs have another run. This was a thoroughly enjoyable production.